The latest reviewed version was checked on 8 November 2017. There is 1 pending change awaiting review. The name of this story in Chinese is 玉兔, or 月兔. The Jade Rabbit, also called the Moon Rabbit, is a rabbit that lives on the moon. In Chinese folklore, it is often portrayed as a companion of the moon goddess Chang'e, constantly pounding the elixir of life for her. However, in Japanese and Korean versions of the story, it is just pounding mochi or tteok. In the Buddhist story "Śaśajâtaka" (Jataka Tales: no.316), one of the Jataka Tales, a monkey, an otter, a jackal, and a rabbit resolved to practice charity on the Uposatha, believing a demonstration of great virtue would earn a great reward. When an old man begged for food, the monkey gathered fruits from the trees and the otter collected dead fish from the river bank, while the jackal wrongfully pilfered a lizard and a pot of milk-curd. The rabbit, who knew only how to gather grass, instead offered its own body, throwing itself into a fire the man had built. The rabbit, however, was not burnt. The old man revealed himself to be Śakra, and touched by the rabbit's virtue, drew the likeness of the rabbit on the moon for all to see. It is said the lunar image is still draped in the smoke that rose when the rabbit cast itself into the fire. The Chinese version of the story the Jade Emperor replaces Śakra. The earliest records suggesting that there is a rabbit on the moon appears in the Warring States period in ancient China. 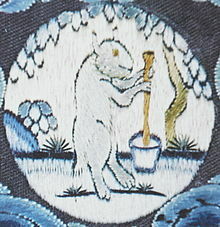 The Chu Ci, a Western Han anthology of Chinese poems from the Warring States period, notes that along with a toad, there is a rabbit on the moon who constantly pounds herbs for the immortals. This notion is supported by later texts, including the Imperial Readings of the Taiping Era encyclopedia of the Song Dynasty. Han Dynasty poets call the rabbit on the moon the Jade Rabbit or the Gold Rabbit, so in the days of old people also use the words "Jade Rabbit" and "Gold Rabbit" to refer to the moon. The moon rabbit was mentioned in the conversation between Houston and the Apollo 11 crew just before the first moon landing; see the previous chapter for details. The American electronic music group Rabbit in the Moon gets its name from this legend. In the novel Watership Down the Grim Reaper in Lapine mythology is the Black Rabbit of Inlé. Inlé is the Lapine word for Moon. In the video game Destiny, there is a weapon called The Jade Rabbit, a semi-automatic rifle with a drawing of a white rabbit decorated on the magazine of the gun. The weapon even bears the Chinese characters for Jade Rabbit. In the music video of the BTS' song "Idol" there is a moon with a rabbit drawn on it. This page was last edited on 29 December 2018, at 20:32.